Less than 5 percent of mid- and high-rise residential condo buildings have a 13th floor, while others have decided to call the unlucky level the 14th. 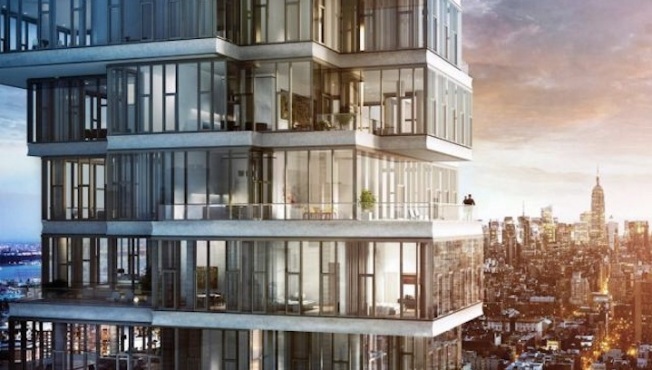 56 Leonard Street in Manhattan, when complete, will boast every amenity you could dream of—an indoor/outdoor theater, a 75-foot lap pool, a library lounge, and a private dining salon. But according to the Wall Street Journal, there is one thing it won't have, a thirteenth floor. "I'm not particularly superstitious myself, but not having a 13th floor is a no-brainer," says Izak Senbahar, the building's developer, says he's not personally superstitious, but doesn't want to alienate potential buyers who are. An analysis of about 1,500 condos in Manhattan and Brooklyn finds that less than 5 percent of mid- and high-rise residential condo buildings have a 13th floor, while the others have decided to call the unlucky level the 14th. Kevin Maloney, principal at Property Markets Group, sites two reasons for the omission. "If there's even a 1% risk that someone won't like it, then why would you do it?" he told WSJ. "It's a simple change to the numbers. It also makes a building seem a little bit taller, which is important in New York. You get an extra floor." However Jonathan Miller, a New York City-based appraiser and president of Miller Samuel Inc. points out that floors on the 13th floor sell just as easily as the 12th and 14th, leaving one to wonder if the superstition lies solely with the developer. Still, Miller admits it's an omission worth making. Some buildings aren't stopping there. It is becoming common practice to omit the 4th floor, as well, in honor of a Chinese superstition of unlucky number four. Which begs the question, which floor is next? See the full story on the Wall Street Journal.